Fifty years ago today, Dr. Martin Luther King, Jr. led the March on Washington, drawing a quarter-million people to the nation’s capital. The March would become one of the largest political rallies for human rights in our nation’s history, and Dr. King’s inspirational words that day—promoting racial peace and equality—became known as the I Have a Dream speech. Photograph: Captain Lloyd George Sealy. 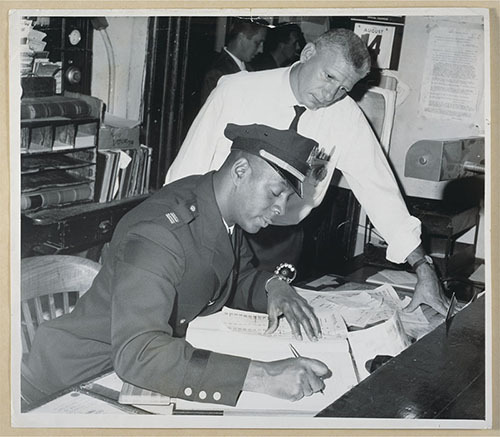 First black Captain of 28th Precinct, Harlem, August 1965. Reflecting on this historic day, Museum staff wanted to share the story of an African-American man working in law enforcement during this tumultuous time in U.S. history. Lloyd George Sealy was born in Manhattan in 1917, and was raised in Brooklyn, New York. Officer Sealy began his career with the NYPD in November 1942. At that time, there were few African-Americans in the department, and most served in precincts in neighborhoods with large black populations. Over the next 10 years, with ambition and grit, Sealy earned both his Bachelor’s degree and Law degree, all while working full time as a police officer—even being promoted to Sergeant in 1951 and later to Captain. Sealy carries a list of firsts for African-American officers in New York: first to command a precinct in Harlem (2nd to command a precinct in all of New York); first Assistant Chief Inspector in 1966; first Commander of the Brooklyn North Patrol Service Area, also in 1966; and, after retiring, first to become an Associate Professor of Law and Police Science at John Jay College of Criminal Justice, a department of the City University of New York. Sealy is also a founding member of the National Organization of Black Law Enforcement Executives (NOBLE). The Lloyd George Sealy library at John Jay College is named in his honor. 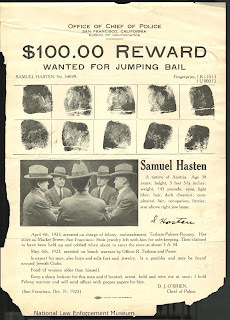 In 1923, Mr. Samuel Hasten was a wanted man. The 38-year-old Austria native was arrested for felony and embezzlement in San Francisco, and was wanted for jumping bail. 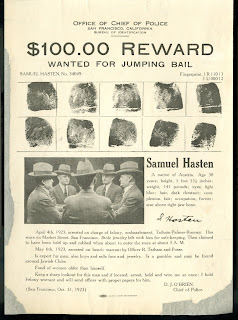 This obscure episode in San Francisco Police Department history would be lost, if not for a fragile wanted poster in our collection. 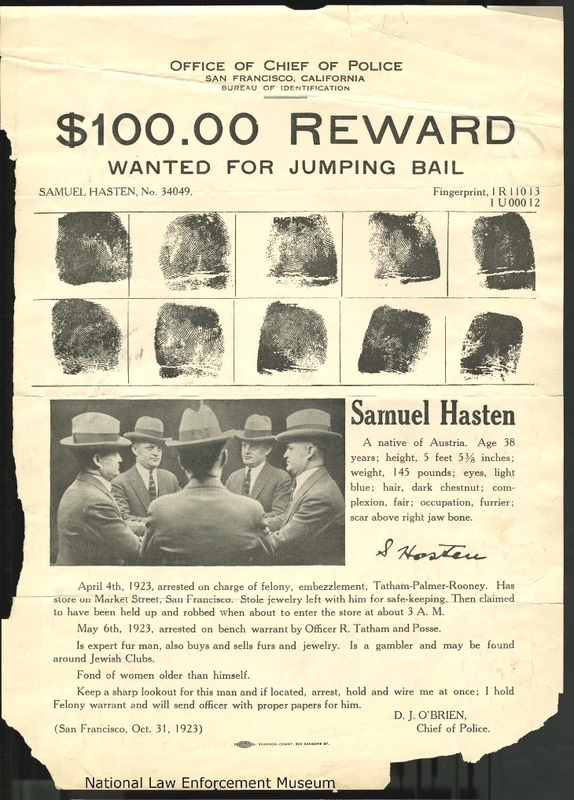 Over the summer, the Museum has begun to preserve that piece of history—the wanted poster issued for Samuel Hasten, in October 1923, by D.J. O’Brien, Chief of Police—along with several other wanted posters in the collection. 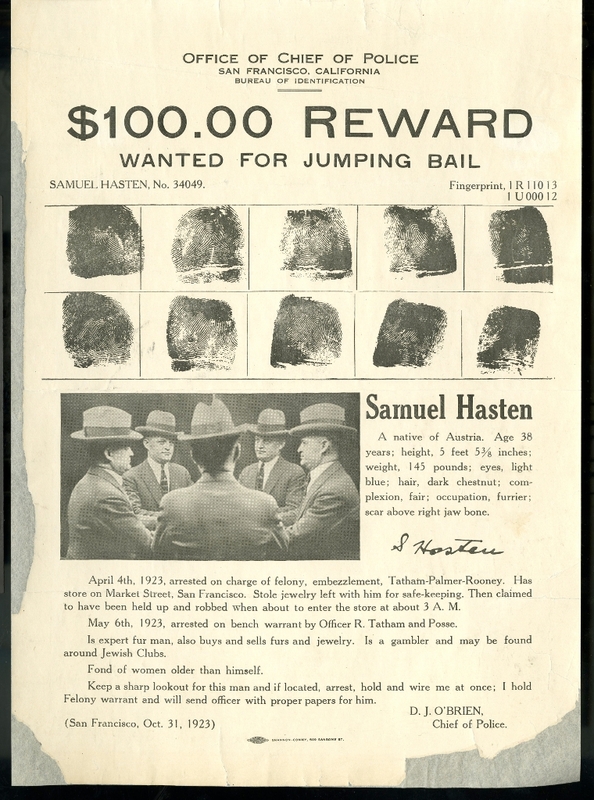 The Hasten wanted poster was treated to remove old adhesive residue and had a deacidification “bath” to remove acids in the paper that contributed to aging and yellowing. Once it dried, it was carefully lined with very thin archival tissue to support the delicate paper. Now that it has been conserved, this document is well equipped to be displayed on exhibit—and will allow the Museum to maintain it in stable condition, indefinitely.